Drop shipping is quickly becoming a thing of the past, whether those of us that use the model like it or not. It’s easier than ever to find economical and efficient ways to own the entire ordering process, from packing to shipping, by incorporating the newest developments in fulfillment technology. Warehouse guru Aaron Rubin joins me in a two-part series about warehouses. We’ll help you determine the right time for starting a warehouse and cover every aspect of running one so yours will be a well-oiled warehouse machine. How to transition from drop shipping to bringing your products in house. 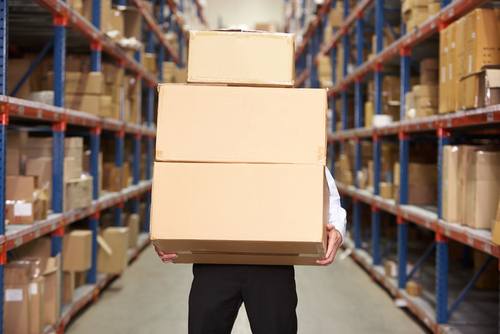 When you should consider switching from drop shipping to starting owning your own warehouse. What you will and will not need to buy when owning a warehouse. Andrew: Excited to have you with me today in an episode where we’re going to be talking about warehouses, running a warehouse, making the migration to one. It’s something I know nothing about. So I brought in a real expert in the warehouse and the shipping space, one of our top contributors in the private community, and really, the man considered to be the shipping guru for our private forum, and that’s Aaron Rubin from Ship Hero. He also owns a number of e-commerce sites in the martial arts space. We’re going to be talking about how do you know when it’s the right time to move to a warehouse, when does it make financial sense, how do you find the right warehouse space, how do the mechanics work behind actually receiving and tracking inventory, why owning a forklift is probably a terrible idea. All sorts of fun stuff in this episode, so stay tuned for that. Frederick, congratulations, man. That is awesome. I have never seen cork wallets before. Seen a lot of wallets, a lot of things in that space. But with a cork twist, haven’t come across that. Very cool looking product. So hope it does well and best of luck. Let me know how things go a couple months down the line. All right, let’s go ahead and get into today’s discussion with Aaron Rubin from Shiphero.com. So Aaron, you’re known in the forum as being the shipping guy that people can attack for all things shipping, all questions shipping and warehouse related. But of course, you run a really successful martial arts e-commerce company, as well. I think maybe fewer people know the story about how you got involved with that. So can you give us, just before we dive into all the shipping and warehouse issues, just in a nutshell, what’s the backstory about how you got into e-commerce and got going? Aaron: Hey, Andrew. So when I was a teenager, I pretty much, instead of mowing lawns, I made my money online with some ads using some ad networks back in, like, ’96 though ’99. Someone called me, family friend, they were looking at buying this martial arts website for $7,000, which seemed like a lot of money to me at the time. He wanted to know if I thought it was worth the money, and I said, “Nah, I could build it for less than that. Don’t even bother.” He said, “Well, let’s build it together.” I was like, “Yeah, sure. It’ll be one more way for me to make a couple thousand dollars a month or whatever.” And little did I know, 15 years later. Andrew: That’s crazy. At the time, were you involved with martial arts at all? Aaron: No, no. The person who I became partners with, he was pretty into it. I started taking martial arts, Jiu jitsu specifically, about five, six years ago. I really like it, but I started with the business first, then the sport. Andrew: And how old were you when you got into this, when you partnered up with this guy and built the site? Aaron: I think I was maybe a sophomore in college, maybe 19, something like that. Andrew: Wow, okay. Awesome. So impressive side hustle, and growing it up from there. Obviously, right now you’re running a warehouse. You stock your own products. I believe you have your own brand of a number of products. Have you always done that? Has that been it from the get-go? Or did it transition from drop-shipping into stocking other people’s products, and then finally creating your own brand? Aaron: So we’ve had ups and downs on that. So initially, pretty quickly we started to just ship our own. Back then, there was not a great way to do drop-shipping. So my partner’s dad’s basement was our first warehouse. We’re a little outside New York City. We had a supplier, we just had a retail store in New York. We would call them up, tell them what they need. They’d UPS it up to us. The next day we would pack it and ship it out to our customers. So that’s how we started. During the financial crisis, we had some really hard times. We went from growing a minimum of 25% a year to shrinking 25% a year, between 2008 and 2009. Nearly went bankrupt, everything went bad. Ended up liquidating all our stock and going through a drop-ship model. Did that for a couple years, and then was back to stocking everything ourselves as we had the capital to do so. Andrew: Wow. So during that period, was there something, a way you were running the business at that time, that gave you a lot of exposure, that looking forward now – even though the economy is doing a lot better – that you’re much more careful of in terms of managing your risk? Did it really change the way you did anything? Would that scare in terms of how you run the business now? Aaron: It was pretty straightforward for us. The accounting was wrong. So we thought we had a lot higher profits than we really did. We thought we had a lot less debt than we actually did. So yeah, when we found out the actual numbers, that was a pretty low day. Aaron: Yes, it sucked. This is a horrible story. I don’t know if I want to tell anyone this story. Whatever. It was a bad day. But anyway, so yeah. Our controller actually has an accounting degree, has a masters in accounting, and we have an outside accounting firm. Yeah, we’re just on top of the numbers. I think that was our biggest mistake. Andrew: Yeah, it’s tough, man. I remember a couple years ago, I would just go for months at a time, sometimes more than a quarter or so, without running the P&L and things, just because I was so busy. Having somebody in place and good systems where you can get accurate financials on a monthly basis is just huge. It’s really important, obviously. So Aaron, again, your expertise is shipping, is warehouses, and really want to dive into that aspect of what you know in terms of helping people who maybe are running a warehouse or maybe people like myself, who do mostly drop-ship and are thinking about getting into either stocking or making their own products down the line. To kick things off, what kind of benefit or margin increase should you expect me to see, to make the investment in fulfilling yourself and stocking yourself worthwhile? Because on the drop-shipping side, yeah, the margins are smaller, but oh my goodness, there’s something wonderful about not having a lease, about not managing a team of employees at a warehouse, about not having that risk and that overhead. And maybe this is a hard question, but is there a rough rule of thumb where it makes sense to take on all that additional work and cost? What kind of additional savings do you need to see? Aaron: Well, first of all, you don’t have to go from one directly to the other. So it’s not a binary choice. You can do a bit of both, right? So when we made that transition the second time, we were still doing millions of dollars in revenue through drop-ship, and we wanted to bring the stock in. We wanted to stock some stuff ourselves, but we had no cash. We were coming off a disaster. So we certainly couldn’t afford to bring in all the necessary stock at one time and get a warehouse, and set everything up and all that. So the way we transitioned was we set up BJJHQ, which is our flash sales site. Flash sales, you only really need to bring in enough stock for a week, so seven products, and that’s how we started it. So transitioned, got much better profits off those, and then grew that to do more. Then, got to expand and work it slowly, expand the space, do it incrementally. So you don’t have to drop a significant amount of money just to try and see how it works for you. Andrew: So when you were bringing in those daily deal products, what kind of margin boost were you seeing? Let’s say, for just the sake of argument, you’re at a 25% margin. Would you see a doubling after 50%? Would you see a quadrupling up to 100% markup? This is a tough question because I know it varies based on industry. But rough rule of thumb, what can you expect to see for bringing your products in-house in terms of stocking and in terms of margin? Aaron: I can talk to the apparel industry because that’s what I know. So on drop-ship, you might be looking at 40 points, so a 40% margin. Versus if you’re taking the stuff in and you’re buying nicely and doing all that stuff, you get a bit over 50. So an item that sells for $99, instead of it costing you $60, it might cost you $48. Aaron: The margins in our business are so little that even a couple of points on margin can be 30% increase in profits, right? Andrew: Yeah, I see what you’re saying. What about warehouse space? I’d like to actually go through the entire process. Let’s assume someone opening their first warehouse, never done it before, and they’re either drop-shipping or using a 3PL now. So walk through a lot of the high level things to be thinking about. Maybe we can start with the space you actually have to do it. You touched on this earlier, that you scaled up, right? You didn’t have to bring everything in stock, all at once. But at some point sometimes, let’s say you’re moving out into a warehouse. Let’s maybe say you’ve fulfilled from your home, or your office, or a garage, or something for a while, but it’s come time to go out and sign that lease. Would you recommend someone starting conservatively, and then maybe having to move out in a couple years? Or would you recommend getting a little more aggressive and having something you could grow into? Because there’s horror stories on both sides of that position. Aaron: Right. For me, I always look at the number one thing you need, is cash to buy inventory. Because if you ever don’t have the cash to buy inventory, your business is likely to fail. So given a choice, everything else could be managed: too little space, not a great space. Everything else you can manage and work around. But if you don’t have the cash to buy your stock, you’re going to go under. So always start conservatively, use that cash for inventory. When there’s no room to walk down the aisles anymore, then you do the hard work of moving. Andrew: This is jumping ahead a little bit, but in terms of financing it, traditionally, what’s been the best route for you to do it? Has it been through cash? Is it easier to go through a line of credit at a bank? Is it really hard to get a line of credit at a bank for a small business? Any tips on thinking through financing those inventory purchases? Aaron: If you’re big, the banks line up to give you money. If you’re small, it’s just not worth the work. So yeah, right now we have a nice line of credit from our bank. I’m sure if I went to another bank, I’ll get one in a week. But when we were just trying to grow the inventory and starting, yeah, the banks had no interest in working with us. Andrew: What are you looking at, what’s a reasonable interest rate for a line of credit? Aaron: A little under five percent these days. Andrew: With how that works, is that something where you have to pay it back within 90 days, within 60 days? How does that differ from just a loan you would go out and get at the bank? Aaron: So it’s ruling. So basically, you usually pay about a one percent commit fee. So let’s say you have a line of credit for $200,000. You’ll pay $2,000 a year just for having it, whether you used the line or not. The rest of it, whatever you use, will be at that interest rate. So let’s say you’re at a five percent interest rate. So if you used $100,000 for that month, you pay a five percent annualized interest rate. So 0.4% for that month and you draw down as you need it. So it’s generally just linked to your bank account. If you have a decent line of credit, there shouldn’t be any fees for moving money bank and forth. You take it in when you need it, when you got to place a big order. And then, when you get the cash, you pay it back so you’re not paying any interest. Andrew: I’m a pretty risk adverse guy, pretty anti-debt guy. You just mentioned you went through a rough time in 2008, ’09, where there was more debt on the books than you thought. Is that something that terrifies you a little bit to use? Even if business is healthy, is it something you’d recommend? Obviously, it’s hard to say just a blanket statement. Needs are different for each company. But do you tend to use that as a funding source and a financing source of last resort? Or is it something you’ve gotten pretty comfortable with? Aaron: I’m really comfortable with it. I think given a choice between debt and equity, debt is way cheaper. So as long as we’re not talking about borrowing on credit cards or some CAN Capital double-digit rates, yeah, take the money. It’s pretty easy. If you have a successful business that’s working and throwing off profits, to pay a five percent interest rate is really not that difficult. Andrew: What about a lease? Let’s say we’re looking at warehouse space. We’re taking your advice, and we’re going to get something that’s really small, maximize our cash flow so we can buy inventory with it, especially if we can’t and we’re not comfortable getting that line of credit. How does a lease work for commercial space? I think most people are probably familiar with the earlier days, leasing out apartments, subleasing it to the sketchy guy who ruins it, and then you’re on the hook for the deposit. I’m guessing it’s a little different with B2B commercial space and industrial space. So any real high level tips or thoughts on how leases work and what you have to do if you need to break out of it before the lease is over? Aaron: So the first thing you got to do when you sign a lease is make sure you have a way out of it. I saw, at a place where we went to look at a lease, a framed check for somewhere in the order of like $100,000 on someone who skipped out on their lease and they had no way out. They just skipped out on it. There was years left on the lease and they took them to court. Eventually, they got a check for every penny as if that person had stayed for the entire term of the lease. So don’t be that guy. So when you enter a lease, always have a way out. Typically, you want to go with a long lease. But with a buyout, which typically the way a buyout will work is you give 30 days notice, and then either two or three months payment. That two or three months payment is just a penalty. You don’t get anything for it. But as long as you do that, you give them the 30 days and then the check for two or three months. You’re out and you’re not responsible for anything else. If you ask for that in advance, you pretty much always get it, unless it’s a really in demand location, but that’s a pretty standard thing. But if you don’t ask for it, they’re not going to offer it and they’re not going to let you out easy. Andrew: Got you. So even if you sign a five-year lease, it’s pretty common to negotiate, “Hey, give me a ripcord to pull out if things aren’t going well. I’ll pay you two, three months rent. And then you can pretty much let me off the hook”? Aaron: Yeah, yeah, exactly. You want a long lease because it’s a real pain to move. You don’t want to be forced to do it on someone else’s schedule. So yeah, a long lease with a buyout is the ideal way to go. Andrew: In terms of the buyout, what about rent-to-own? Because buyout is your ripcord. It’s not buying to own, if I’m understanding that correctly. Is it very common to set up where you lease to own? Is that something that’s pretty common and worth thinking about, or not really? Aaron: I’ve heard of that, but I don’t know anyone who’s ever done that. Andrew: Okay. Unless you, man, really, really get lucky, I’m guessing you’re going to have to change things or renovate things. It’s not going to be as needed for what your business is moving in. So if you do have to make changes and renovate, is it safe to say you as the tenant are paying for all of those? Or can you convince the landowner to maybe pay for a percentage of the improvements? Aaron: You can convince them. For them, it’s fairly straightforward. What they’re going to do is they’re going to figure out how much it’s going to cost. They’re going to amortize that over the length of your lease, with a little interest rate for themselves. Then, they’ll do the work. Because for them, they’re getting the money over the term of the lease back with a little interest. As well as if you renew, also now the rent has been established at a higher rate. So you’re going to renew at that higher rate so they continue to make a profit off it. If you leave, they probably can lease for a little bit more because it’s got some improvements. If you do have them do work, on a buyout, they’re going to require that you reimburse them for either a prorated or the full amount of the landowner’s improvements that they did. Andrew: I see. So if you do make improvements or ask, you make them and ultimately the landowner ends up paying for a portion of them. They won’t compensate you in cash. They will probably just say, “Hey, we’ll take on the cost of these improvements, but we’ll just probably increase your rent accordingly.” Is that how that usually works? Aaron: Yeah, yeah, exactly. They’ll give you a quote on the rent that’s higher. You could do it yourself. We did the work ourselves so that we wouldn’t have to do that. So you can invest the money yourself, just make sure you have a long term lease with your option. So we did a five-year lease with two five-year options so that if we want to stay for 15 years, they can’t kick us out. It has in there, obviously, rent increases. You have to negotiate those. But at least you know it’s at a reasonable price, and for 15 years, it’s yours. Andrew: What about things you need at a warehouse in terms of actual attributes of the space? You see those massive roll-up doors, the high ceilings, HVAC systems, all these things I have no idea about because I’ve never had a warehouse. Are there certain things that really are important to have, and especially so if they might not be things you’d think of right off the bat? Aaron: So in terms of the roll-up doors, what you really need is a loading dock. So unless you’re getting stuff only from UPS, FedEx, or DHL or something like that, where it’s just small parcels, you’re going to get stuff via pallets. A pallet comes up in a truck. The truck’s pretty high. There’s no way to get it off that truck if you don’t have a pallet. Or unless you’re willing to cut it, lower every item one by one, which takes a two-person job and a really, really annoyed truck driver if you make them do that. Most of them, they don’t want to stand there, obviously. So yeah, get a loading dock. It doesn’t matter if it’s a shared loading dock or if it’s far away from you or whatever, but just make sure you have a loading dock. If you don’t, you’ll regret that. Other than that, I would say the next most important thing that people don’t think about is the floor. You want something with a smooth, not pitted concrete floor, for a couple reasons. One, cheap floor a lot of times, well, it will always come up. The concrete dust comes up and your products get covered in concrete dust. And then the other problem is, in terms of rolling carts or anything, if the floor is pitted, they’ll get stuck. You’ll break wheels. Again, it’s not something people generally think about. But if you have a bad floor, you’ll regret it later. Andrew: So if you got a loading dock, pulling stuff off on a pallet, you’re probably going to need a forklift as well, right? Aaron: You just get a pallet jack. They’re manually operated. A new one is probably $400. You can probably get a used one for a little cheaper than that. Not a huge expense. Andrew: But they’re not nearly as much fun as a forklift though, are they? Aaron: Yeah, but the forklifts, you got some legal liability there. You have some training requirements, and lots of maintenance costs. The biggest issue with them is if they crash into a row of racking, they can knock it over. If there’s someone on the other side, that could be a serious issue. So there’s a lot of other stuff you have to do to ensure safety if you’re going to get one. I would actually say that that’s something you buy pretty far down the line. Avoid using that if you can. Andrew: Right, maybe we’ll stick to that pallet jack. Andrew: So let’s move onto some of the principles behind running a warehouse and stocking products. So you just touched on receiving the product at that loading dock. How do you receive orders into inventory? How does that process work and why is it really important? Can you walk us through everything from getting that pallet off the truck, to entering the stuff in the computer, and then getting it on the shelves? How does that work? Aaron: Yeah, so it’s pretty straightforward if you have it set up well. Usually, someone enters a purchase order. So it records what is expected along with the price. Then, the warehouse sees what’s expected. They’ll also always get a list from the company that’s shipping the product of what they actually shipped. If there’s a discrepancy, they’ll reconcile it then, before they even look at the product, be like, “Oh, we ordered ten, they only shipped eight.” So you want to know that in advance. And then, they just check off the product and make sure that it matches either the PO or what they told you was going to be received. If it matches the PO, then great. If it matches something else, then you need to reconcile that, both with how much you pay, so you’re not paying for product you didn’t get, and then, also with what you enter into your inventory, so you don’t sell a product that you don’t have. Andrew: When you say PO or purchase order, for people who may not be familiar with that, can you define what that is? Aaron: Yeah, so a purchase order is just a way of recording in your system what you ordered from your vendor. So it’s not much more than just a receipt, really. Andrew: So you write up a PO, “We want 10 of X, 9 of Y, and 100 of Z,” and you shoot that over to your vendor and they send it back to you. And then, you can compare what you originally ordered, your PO which you submitted to them, with what they actually sent you. Aaron: Right. Well, first, usually they’ll tell you if they’re short of anything, if the expected shipment is going to be any short. But then, yeah, you always have to check with what actually came in. Because a pretty significant amount of the time, they don’t match. Sometimes you get more. Sometimes you get less. Sometimes you get different, but you want to know. Andrew: So when you get these things, they come in, everything looks good. In terms of accounting, do you enter them straight into QuickBooks? Is there another program you use to keep track of the number of things that you have and how much they cost? Aaron: Yeah, so your warehouse management system needs to always know what’s in stock. So any base level warehouse management system, obviously our product, ShipHero, does it. But really, anything that manages your inventory has to know at all times what you have in stock because that syncs up to your cart. That’s how you know what’s going on. In terms of the accounting aspect, I know we spoke before about, “Hey, we have an accountant on staff and we have an outside accountant.” I don’t sweat too much if we’re doing FIFO, LIFO, cost average. It doesn’t make a huge difference. For the most part, your products are going to be roughly the same cost whether you bought them at the beginning of the year or at the end of the year. The costs are never super accurate because you could do a landed cost with the inbound shipping, which always varies. If you’re within one or two percent, don’t worry about it. What you really need to know is what products you have in your warehouse. Everything else, you can figure out later. So when the purchase order comes in, whatever system you’re using to manage your inventory just needs to increment those skews by that amount so you know what you have. Andrew: Yeah. So you’re saying in terms of tracking the cost of. If the supplier raises the price or decreases the price of something, you’re not sweating that, “Oh, my goodness. This widget, even though we’ve got 100 of them, this specific widget which we got in August and we’re now selling, was a $1 less than this other one,” or whatever it is. Really, it’s not worth the additional hassle for the insights that you get, in terms of the cost that get sold. Aaron: Exactly. Don’t tell the IRS this, but most people, almost no one, really worries about getting into those couple of percent. Maybe if you’re a public company or you got some big reporting stuff, you have to worry about it. But for people like us, yeah, you got more important things to worry about. Andrew: Yeah. So ShipHero is your product. We’ll talk about this a little bit further on down the line. But it’s an iOS based inventory and shipping management software and platform that really streamlines and facilitates, making it easy to run a warehouse. So does ShipHero help you track the cost and the quantity? So when you get that stuff, let’s say you get ten Gi’s. Is that how you pronounce it, Gi’s, Guys? Andrew: So the karate gi’s, let’s say you get 100 of those in. You check them off on the PO. They all look good. With ShipHero, do you write on ShipHero? Do you say, “Okay, we have 100 of these items,” and then you just put 100 in there? You enter it into the system, and then you put them on the shelf and that will remember the pricing and quantity, and sync everything up? Aaron: Yeah, exactly. So on your iPad, you’ll see a list of all your purchase orders that was placed by customer service, or purchasing manager, or whoever places the orders. So you just see a list of them. When they come in, you just open the correct one. It shows you a picture and a list of the items. You either scan a bar code to enter it, or find the picture and match it. Then, you just put in how many. It says, “We ordered 100,” you say, “Well, we only got 99,” or, “We got 101,” it was our lucky day. Or maybe we actually got 100. And yeah, you just save that and then it updates the stock on the floor, knows where it is, and updates your inventory value for accounting, updates your cart, and all that stuff. Andrew: Wow. So it’s synced with you use Shopify for some things, and so it will automatically sync up with Shopify’s inventory. So if it was out of stock on the Shopify site, it all of a sudden will be available. Will it also push the price, the value, and all that stuff to Xero? I don’t know if you use Xero. Or will it push it up to Xero or QuickBooks, as well? Aaron: Yeah, we love Shopify. They’ve got a great API. It will push it up there. We work with most of the big platforms. It will push it to all those within three minutes. We’re just using Xero now, so we’re just going live with Xero now. So we’ll push it to Xero. QuickBooks is on the roadmap, but we haven’t done QuickBooks yet. Andrew: That’s really cool that you have all of your POs right within ShipHero, too. Because I didn’t even think about that, but it makes perfect sense. Obviously, you built ShipHero because you just saw a huge pain in terms of managing this without it, and so you saw a lot of room for improvement. If somebody’s not using ShipHero, what’s the legacy method of doing all this? Is it all integrated like this? Or is it usually across two or three different systems? How were you doing it before ShipHero, is maybe is a better question. The main problem with that is every day, you’re either overselling something because you don’t have any, or you’re underselling something because you think you don’t have any and there’s product sitting there. It’s just money sitting on the shelf that you’ll never be able to get any value from because you don’t know it’s sitting on the shelf, or at least your shopping cart doesn’t know it’s sitting on the shelf. Andrew: Yeah, it’s crazy. And again, no personal experience here, but just looking through the ecosystem of apps, plug-ins, and SaaS applications. It seems like to do this well, and a lot of times a lot of guys and a lot of forum members, maybe they’ve got an ERP, but then they have something like Stitch Labs, or they have something that manages the shipping. But then, they have something that separately manages receiving and syncing. It’s a patchwork quilt of anywhere from two – if you’re lucky – to three or four different things that you’ve got to try to configure to all work together. It sounds like a lot of work. Aaron: Yeah. Typical, stuff you see on the forum, a lot of Stitch Labs plus ShipStation, which I think is a really popular combo. The inherent difficulty with that, that I can never wrap my head around, is that you need to know in real time what you have on your shelf. I’ll give you an example. So an order comes in in the morning, right? And then I go to count the items on the shelf to see how many there are. I know the order was printed, but I don’t know if that item was taken off the shelf or not. So therefore, when I count that, I don’t really know how many there’s supposed to be because we don’t know if it was picked or not. So therefore, when I “correct” that count – in my air quotes – it could be it was correct, but the item just wasn’t picked yet. So now I just lowered my stock by one, even though it’s really there. Or I increased it when it’s not really there. I really don’t know how anyone manages without that being real time. I don’t see how it’s really possible to get a perfectly accurate inventory count. Andrew: What about laying out a warehouse and tracking skews? You hear about Amazon, and obviously, they’ve probably got this dialed as well as anybody. But they’ve got this crazy system where they’ve got some algorithm. You’ll see dog chew toys next to high-end wine glasses, based on what gets pulled the most frequently. For smaller merchants, or non-Amazon merchants, how do you do it? Is there a numbering system that when a packing slip gets pulled off, it has all the numbers and then people can just, based on the numbers, really quickly find things? Is it bar code related? How do you keep things organized and easy to pull when you’ve got a guy who comes in who maybe is getting trained and doesn’t have everything memorized where it is? Aaron: We all have robots, what do you mean? Andrew: Yeah, all of us. Amazon, they’re just licensing out that technology to everybody. Aaron: Yeah, of course. Everyone just buys a robot. Go to Home Depot, get a robot. Yeah, but it’s pretty simple once you know what to do. Basically, you line up your shelves and they all have what we call bin locations. So it’s just like a real simple grid, like New York City streets. It’s A, B, C, D, E, F, and then it’s 1, 2, 3, 4, 5, and every location is in a bin. While we don’t have pick papers, we use everything on the mobile devices. The mobile devices route you in the walk order of the warehouse. So it will tell you, “Go to A1 to grab something for this order. Go to A3 to grab something for that order. Go to B1,” whatever. It routes you intelligently. So really, the people don’t have to know the warehouse layout. It’s a grid. You learn it in 30 seconds. And then, if you have bar codes and pictures, you really don’t have to know the products that well because pretty much anyone can match a picture, and bar codes will only match if you scan the write one. So it’s pretty hard to pick the wrong one. What Amazon does is something called dynamic slotting. Dynamic slotting means you can put anything anywhere. We have some high-end customers that do some stuff like that, but that’s not something you should be worrying about at a small scale. Andrew: So for every product that ShipHero knows about, you can assign a grid location to it. And then, just like a high-end UPS routing algorithm, it will say, “Hey, you need five things over in this corner of the warehouse, but go here first because you’re really close to it,” and it will give you the best, most time efficient route on your iPhone, to go and get the thing that you need? Aaron: Yeah, you make it sound way more complicated than it is. It’s not. Since it’s a grid, it’s not that complicated to figure out what’s next in order and what’s just the ideal way to walk the warehouse. So yeah, it’s fairly straightforward. It’s one of those things that computers could do real easily and really well. If it was a person, they’d be sorting a whole bunch of papers. Andrew: Yeah, very cool. Hey, it’s Andrew here off a discussion with Aaron. Our discussion really took off. We got into a lot of depth and ran well over what I was planning on. So we’re going to be breaking this up into two episodes. So next week, please come back, tune in. We’ll be picking up where we left off to talk about staff, the entire process from new order to getting an item shipped, counting inventory, metrics to track, and a few thoughts on branding. We’ll be finishing up next week. So thanks for listening and looking forward to talking to you then. That’s going to do it for this week. But if you’re interested in launching your own e-commerce store, download my free 55-page e-book on niche selection and getting started. If you’re a bit more experienced, look into the eCommerceFuel private forum. It’s a vetted community for store owners with at least $4,000 in monthly sales, or industry professionals with at least a year or more experience in the e-commerce space. 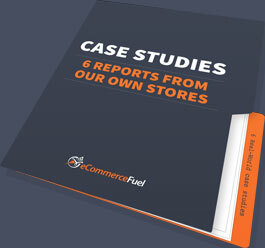 You can learn more about both the e-book and the forum at ecommercefuel.com. Thanks so much for listening, and I’m looking forward to seeing you again next Friday.